A beloved fairy tale reimagined A poor shoemaker must close his business as there is no work, but his cat is determined to save the shoemaker from his plight. Using a magnificent pair of boots and a sly plan, the trusty cat tempts a monster and tricks the beast into using his own vanity against himself. With the monster defeated, the shoemaker reopens his shop and can once again sell his beautiful shoes to the townspeople. 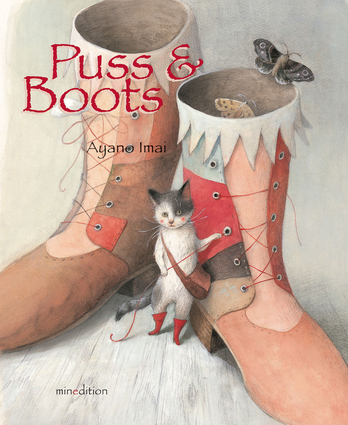 A beautifully distinctive retelling of a classic tale, this children’s book features enchanting illustrations from acclaimed artist Ayano Imai. Ayano Imai is the illustrator of Aesop’s Fables, Chester, and The Town Mouse and Country Mouse. She studied Japanese painting, with a focus on mineral pigment painting, at Musashino Art University in Tokyo.